252 pages | 3 Color Illus. | 20 B/W Illus. Regenerative therapy has rapidly developed as one of the most promising treatments for patients suffering from severe heart failure. Autologous bone marrow-derived cells and cardiac stem cells have been clinically applied for cell injection therapy for heart failure. As a next-generation therapy, tissue-engineered myocardial-patch transplantation has also been started clinically. As further advanced therapy, several researchers have started to fabricate three-dimensional beating myocardial tissues. One of the main problems in myocardial tissue engineering is neovascularization within the tissues during scale-up. Several innovative technologies have been developed to overcome the vascularization problem. 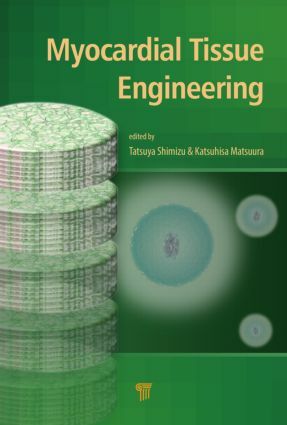 This book broadly summarizes myocardial tissue engineering and regenerative medicine, which consists of myocardial cell sources, cell therapy for damaged hearts, and tissue engineering technologies for fabricating beating hearts. With respect to myocardial cell source, it focuses on cardiac cells differentiated from embryonic stem and induced pluripotent stem cells. It describes the remarkable results obtained in the past and the present to control neovascularization and presents the future challenges in myocardial tissue engineering research. Tatsuya Shimizu is a professor at the Institute of Advanced Biomedical Engineering and Science (ABMES), Tokyo Women’s Medical University, Japan. He received his PhD in medicine from Tokyo University, Japan. His areas of expertise are myocardial tissue engineering based on cell sheet technology, neovascularization in myocardial tissue grafts for scaling-up, and tissue factory fabrication for industrialization of regenerative medicine. He has 96 publications to his credit. He has received the Takagi Award, Intelligent Materials and Systems Forum (2001); best poster award, 5th International Meeting of Tissue Engineering Society (2002); Young Investigator’s Award, the Japanese Circulation Society (2002); The 2003 award of the Medical Association of Tokyo Women’s Medical University; Best Oral communication Award, Annual TERMIS-EU Meeting (2006); The Award of Cardiovascular Regenerative Medicine, the Japanese Circulation Society (2007); The Commendation for Science and Technology by the Minister of Education, Culture, Sports, Science and Technology (Research Category) (2009); The 7th Monozukuri cooperation Award, Nikkan Kogyo Shimbun Ltd. (2012); and Japan Heart Foundation Satoh Memorial Award, The Japanese Circulation Society (2014). His current research interests are vascularization and heart engineering. Katsuhisa Matsuura is an associate professor at ABMES, and Department of Cardiology, Tokyo Women’s Medical University. He received his PhD in medicine from Tokyo Women’s Medical University. His areas of expertise are cardiology, regenerative medicine, stem cell biology for scale-up and tissue engineering. He has received Young Investigator’s Award, The Japanese Circulation Society (2005); Inoue Memorial Foundation Research Award, Inoue Research Foundation (2007); Yamakawa Hisako Research Award, Tokyo Women’s Medical University (2008); and poster award, Molecular Cardiovascular Conference (2007 and 2008). His current research interests are stem cell expansion biology and technology and cellular sociology in bioengineered tissue.